In 2013 the Benevolent Society launched a $10 million Social Benefit Bond to fund Resilient Families: an intensive family support program keeping children with their families, where safe to do so, and out of foster care. Social Benefit Bonds are a relatively new type of investment which allow private investment in instruments that deliver both a social and financial return. They are growing in popularity around the world. However, because they are so new, very few people have a sense of what their investment actually means and why this particular bond will take time to mature and deliver on financial returns. After two years of implementing the Resilient Families initiative, it was time to communicate the impact the program back to investors. But rather than just delivering a report, the Benevolent Society asked Digital Storytellers to help them tell the Social Benefit Bond story in a way that would engage both the minds and hearts of investors. 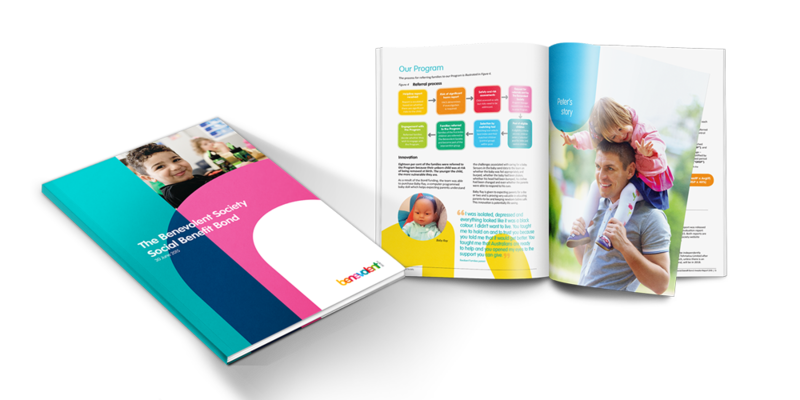 We worked with the Benevolent Society Team to hone in on the Social Benefit Bond story, provided design support for the report and delivered two compelling digital stories, including the story of young mother whose life had been directly impacted by the Resilient Families program. These stories communicate the merits of the bond as an investment, but also highlight the social purpose behind the bond. Digital Storytellers is proud to participate in moving forward and telling the story of cutting edge social investment initiatives.